Dragons’ Den entrepreneur James Caan has sparked dismay after he was filmed offering to buy a baby from a poverty-stricken family. 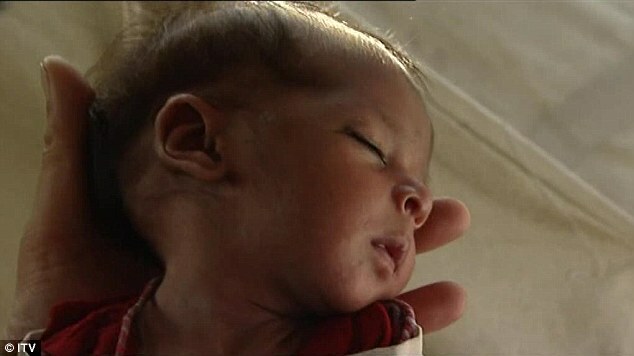 The Pakistani-born star was in the country filming an ITV report about his charity work when he was handed a newborn baby girl. Moments after taking the baby in his arms in a flood-hit village, he offers to buy the child for 100,000 rupees – about £700 – to give to his brother. However, the Dragon today claimed he had only spoken out in the heat of the moment, in the heat of an emotional situation, and quickly realised the baby should not be moved from its family or village. It is only later after reflection that the star backtracks, telling the ITV crew: ‘I was literally at that moment in time so taken away with emotion. Later he is seen breaking down in tears. He is then seen asking: ‘Where is the mother and father?’ before making the disaster-struck family the ‘deadly serious’ offer of money for the child. Today Mr Caan defended the scenes that have shocked children’s charities, saying his outburst was a ’emotional response’ to the horrors he had witnessed. ‘It was more an emotional response than a rational thought,’ he told Radio 5 Live. ‘As soon as I came out of the village I reflected on the moment and realised it was clearly not the right thing to do in that situation. ‘I clearly have regrets. It wasn’t rational and it wasn’t right. He said after they moved away from the family his daughter had told him the baby belonged to its family and the village. He added that his brother was unaware of the incident. Caan heads a foundation aiming to raise £500,000 to rebuild the devastated canalside village of Jan Lunda, 100 miles north-west of Islamabad. The 49-year-old is best known for his appearances on BBC’s Dragons’ Den, in which he has featured for three series. He lives in London with his wife, Aisha, and two daughters Hanah and Jemma-Lia. He moved to Britain from Pakistan as a child – his original surname was Khan – and grew up in Brick Lane, East London. Instead of going into the family business he chose to start up his own headhunting company from scratch. He is now head of a private equity firm and is thought to be worth around £130million. Yesterday he told how he had scrapped plans for a glitzy 50th birthday party so he could carry on helping flood victims in Pakistan. He told The Sun he would instead fly out to Jan Lunda for the day with his family. He is asking people to donate money for new £1,500 brick homes in Jan Lunda to replace the mud huts swept away by the flood. Philippa Lei, of children’s charity World Vision, said she had been ‘shocked’ by the film. ‘It is understandable to have a strong emotional reaction in that situation but it is not the best way to help children to take them out of their communities,’ she said. A spokesman for Save the Children said: ‘It is never right to buy children and we are glad that Mr Caan came to his senses. ‘When confronted by a vulnerable infant, amidst the debris of Pakistan’s devastating floods, it is a human impulse to try to help. ‘In the aftermath of disasters such as Pakistan’s, children are terribly vulnerable. Rosie Shannon, of Save the Children, added: ‘We absolutely respect what he’s doing in Pakistan to help millions of people. Next Roshonara Choudhry supporters are living on Kuffar! have you ever tried avast antivirus before?